Hair clip-automatic is traditionally used in order to collect the hair in a ponytail. However, with imagination and minimal skill, you can perform interesting hairstyles for both everyday wear and for an evening out. In addition, this accessory is presented in various forms, colors and materials are available to enhance any creative idea. For medium length hair, you can perform simple everyday hairstyle, relevant both for shopping and for office. Gather your hair into a low ponytail at the center or side of the head. The usual braid braid and give it volume, spreading links across the width. Then tuck the braid inside and securing it at the base of the hairpin machine is in the form of a flower or bow. Hairstyle looks beautiful with long asymmetrical bangs, or wavy strands to frame the face. To create an easy romantic image, divide the hair horizontally. The top volume fasten with hair band. Then, forming a small hole at the base of the ponytail, tuck it upward and push into the hole, and then pull it down towards the main mass of hair. Thus, you should get a small knot, covering the hair band. Fasten underneath with a cute hair clip-small machine size. Simple and modern look hairstyle from the lateral flagella, removes hair from the face and fastened in the back with a hair clip. Instead of flagella, you can also braid small braids in the technique of Danish weaving or weaving "fish tail". 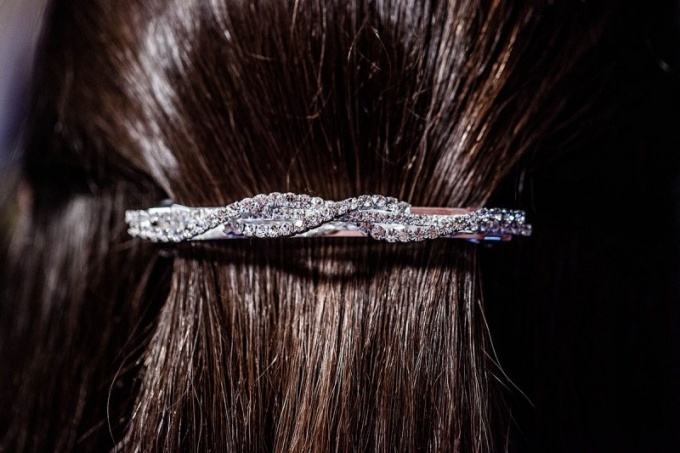 Any hairstyle can purchase a festive look, if you use the pin-slot, decorated with rhinestones or flowers. Appropriate these clips look like on simple bundles, and complex braids. Exotic looks classic shell, fixed on the side with the hairpin in large flower. To create a simple but elegant up-do hair, casually twist the hair bundle, turn in a circle and fasten with a clip diagonally. This hairstyle looks nice on wavy hair of medium length with volume at the roots. For deliberate negligence will release a few strands from a bundle of one-third of their length. Divide the hair parted in the middle. Twisting the halves in the harness, gradually reduce the hair to the back of his head. Connect them with a clip slot, and the ends of the hair curl. The remaining tail can be put in the beam for the previously described method. To perform this hairstyles can also need hairpins and hair clips-Bobby pins. Hairpin-machine can be used on short hair, but it should be of small size with a tight clamp. For example, it is possible to wind the hair and put them in a familiar way. Hairpin-machine can be placed on the side or to pin her bangs at the top.